Chicago historian and broadcaster Louis "Studs" Terkel is most widely known for his oral history projects, through which he collected hundreds of interviews of Americans from all walks of life. 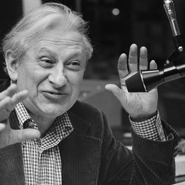 After receiving a law degree Terkel began radio broadcasting through the Works Progress Administration's Federal Writers' Project. Between 1952 and 1997 he hosted a weekly radio show called The Studs Terkel Program, on which he interviewed a diverse selection of famous and ordinary Americans, including Bob Dylan and Leonard Bernstein. Turkel was blacklisted during the McCarthy era for refusing to name names to the House Un-American Activities Committee. In the 1960s, Terkel worked to preserve U.S. history by collecting personal stories from a cross-section of Americans; he assembled these recollections into books such as Working (1974), which was made into a Broadway show in 1978, and Race (1992). He won the Pulitzer Prize for General Non-Fiction in 1985 for "The Good War": An Oral History of World War II. In 1997, Terkel was elected to the American Academy of Arts and Letters.